A former Niger Delta militant leader, Government Ekpemupolo, also known as Tompolo, has reacted to the Economic and Financial Crimes Commission, EFCC’s plan to declare him wanted in connection with an alleged fraudulent multi-billion naira contract. Mr. Ekpemupolo said in a statement Saturday that the EFCC merely resorted to “self-help” after failing to appear before a court in an earlier case he filed against the anti-graft agency. Mr. Ekpemupolo said he went to court after the commission froze his company’s accounts since August 2015. He said if there were questions regarding the contracts awarded to him, they should be directed to the federal government bodies that approved and awarded them. I, High Chief Government Ekpemupolo wish to state that my attention has been drawn to a news story on Channels Television of 10th December 2015. The impression being conveyed is that I was invited by the Economic and Financial Crimes Commission (EFCC) and I failed to honour the invitation or even respond by letter to the invitation. On the contrary, nothing could be further from the truth. On the 24th of November 2015, I was informed at about 4pm that a letter of invitation had been dropped at my home in Warri, inviting me to EFCC’s office in Lagos by 10am on the 25th of November 2015. I responded by a letter from my Solicitors, Messrs Jakpa, Edoge & Co. The letter dated 25th of November 2015 was received by one Uduak Ouot, a staff of EFCC on the 3rd of December 2015, after several attempts to deliver. I have proof of delivery from the courier company. I was therefore not a little surprised that the EFCC – an otherwise reputable institution – would stoop so low as to lie to Nigerians. As my Solicitor’s letter indicated I am already in court with the EFCC in Suit No: FHC/W/CS/152/2015. EFCC had been served with the court processes since 20th of October 2015 but they refused to attend court on several occasions, or to file any court papers, only to appear for the first time on 30th November 2015 without filing any court papers. They even asked for the matter to be adjourned to 17th December 2015, the date they are now inviting me to appear before them. In fact, EFCC only invited me two months AFTER I sued them. In my Solicitor’s letter I informed them that as soon as the court decides one way or another, I would honour their invitation. So the attempt to harass me by their reminder of 9th December 2015, which was leaked to the media on the 10th of December 2015, the same day as it was delivered to my house in Warri is an unnecessary and face saving effort at brinksmanship. As a full blooded Ijaw man and citizen of Nigeria, I have done everything in my power to follow the laws of Nigeria. Since the amnesty declared in 2009 by late President Yar’ Adua I have strained myself to ensure that we all live in peace in this country. Those who think they can push us to war must rethink the necessity of such a war. How can a law-abiding Government declare a man wanted who is in the law courts with them? They froze our business accounts since August 4th 2015, but we have not quarrelled with anybody. We sued them to court, they refused to come to court. Now they are threatening to declare me wanted. I know why they are after me. It is not the alleged multi-billion naira property transaction. Afterall, it went through due process and was approved by the Federal Executive Council (FEC). And as such if there are any questions to answer, it is the people at the FEC, Bureau of Public Procurement (BPP), Federal Ministry of Lands and Survey, Federal Ministry of Transport, NIMASA, etc who approved the transaction that should be answering such questions. The real reason this All Progressive Congress (APC)-led Government is after me is that I bluntly refused to join APC and to support their Governorship candidate in Bayelsa State. We cannot all be in APC. Our people have always believed in the Nigerian project and had always hoped to join hands with this administration to move this project forward, but the conditions being attached are not acceptable. I insist on believing in the Nigerian project unconditionally! We will continue to pursue our court case. The threat to declare me wanted is an unnecessary attempt to heat up the polity. I will go about my daily business, usual. Finally, let me say this: if people can come from Sokoto, Katsina or Lagos to campaign in Bayelsa, why can’t I, a full blooded Ijaw man, go to my Bayelsa to campaign? I will only add this: let the will of the people of Bayelsa prevail. Nobody should attempt to force the outcome of the election. We have kept faith with our promise to Nigeria, we expect no less from this country. 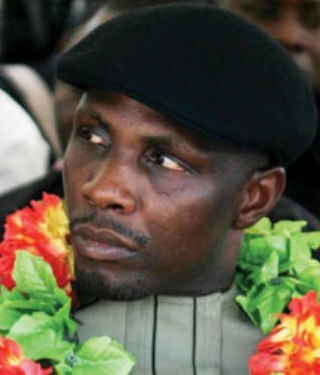 So if anyone tells you that Tompolo is on the run, tell him Tompolo is not going anywhere.